Now, we all wear gloves in the fall. But on our heads rather than our hands? Well, that's a new one. 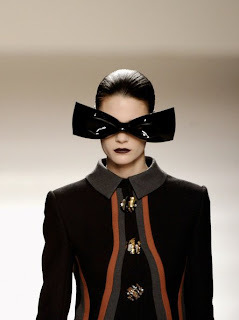 But that's exactly what happened at Dolce & Gabbana during Fall 2009 Fashion Week. Model Chanel Iman walked down the runway wearing hot pink gloves on top of her head (as seen at left) ... and Dolce wasn't the only designer to pick out of the ordinary places to put accessories. 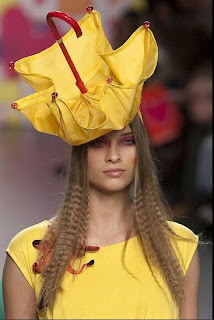 Lydia Delgado and Agatha Ruiz de la Prada went the same route, using everything from umbrellas to oversized bows! See the pictures and weigh in after the jump. 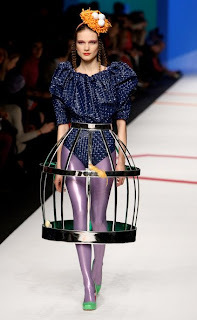 I've heard of hair looking like a bird's nest, but I've never actually seen one used as a hair accessory before this shot at Agatha Ruiz de la Prada! I have a feeling this trend won't be catching on ... but I'll leave it up to you to decide. Let me know your thoughts in the comments!